A shielded curio light mounted in top of cabinet casts a warm glow on your keepsakes. Hardware package available separately below or save by choosing the SPECIAL which includes both the plan and the hardware package. Measures 35 inches high x 38 inches wide x 18 inches deep. 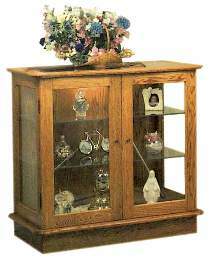 Display Cabinet Hardware 1853 Hardware package contains non-mortise hinges, cabinet knobs with magnetic catches or key plate and lock, shelf supports, and a cabinet light with bulb.